Dirk decided to enter veterinary medicine during the 1980’s after a 12 year career as a biologist which took him all over Canada. 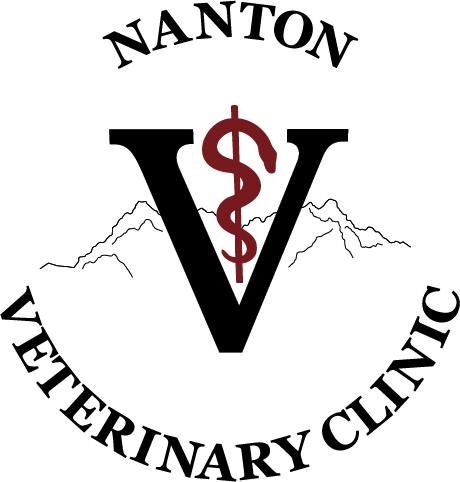 He completed his veterinary education at the Atlantic Veterinary College, University of Prince Edward Island, and joined Nanton Veterinary Clinic in 1991. He has been co-owner since 1993. He enjoys the diversity of mixed animal practice and has special interests in surgery (including orthopedics) and small animal dentistry. Another special interest is dealing with emergency and trauma cases including dealing with injured wildlife; he provides first treatment to several hawks and owls every year before sending them on to rehabilitation. Dr. Kaitlyn Matters grew up in Vermilion Alberta on her parents small farm. Her love of animals started at an early age and she knew that one day she wanted to be a veterinarian. 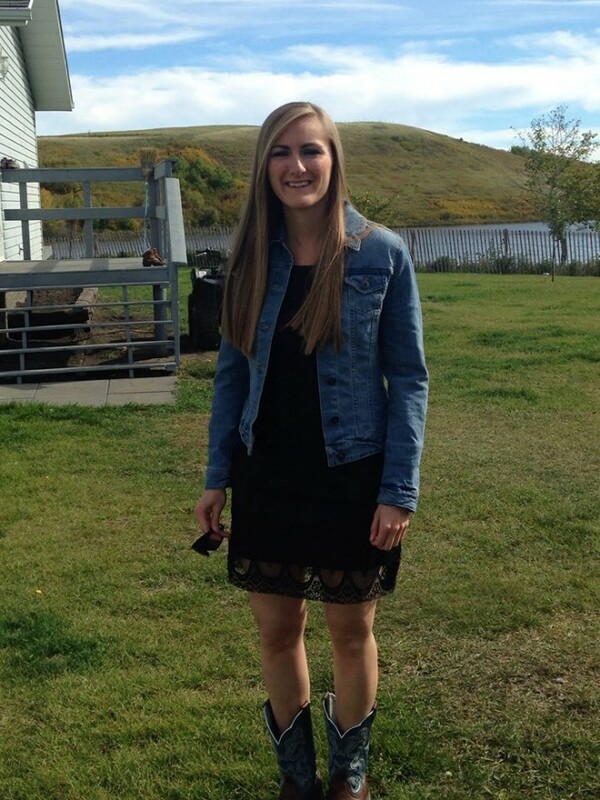 Kaitlyn graduated from the University of Calgary Faculty of Veterinary Medicine in 2015. She spent her first two years working in Claresholm before joining the team at the Nanton Veterinary Clinic as a part time Veterinarian. Kaitlyn enjoys the variety that mixed animal practice likes to offer as no two days are the same. Mike was born and raised in the Brant area. 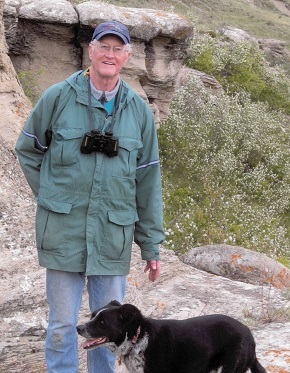 He graduated from the Western College of Veterinary Medicine in Saskatoon in 1980. 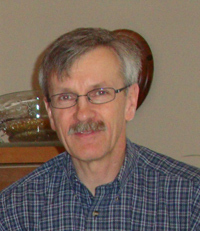 Mike has practiced in Nanton for over 30 years and has co-owned the practice since 1993. He enjoys mixed veterinary practice, with special interest in equine dentistry and bovine herd health. Mike lives in Nanton with his wife Sandy, their 2 children and 1 dog. Stephen grew up around the Nanton Vet Clinic since elementary school. An agriculture degree from the University of Alberta was followed by graduation from the Western College of Veterinary Medicine in Saskatoon in 2009. For the first five years after vet school, Stephen worked at a mixed animal veterinary clinic in Innisfail before returning home in 2014. He has now bought into the clinic. He enjoys the mixed challenges of mixed practice: particularly enjoying bovine cases, and dentistry both equine and small animal. 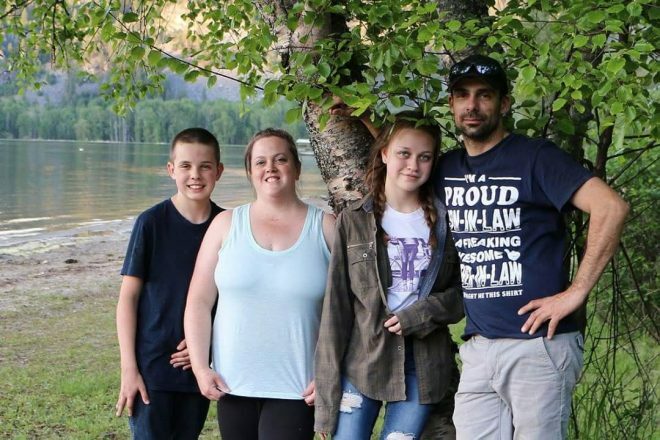 Outside of work he is active as a Scout leader, and enjoys many outdoor pursuits such as hiking and camping, though much spare time in recent years has been dedicated to his participation in the Innisfail Legion Pipe. 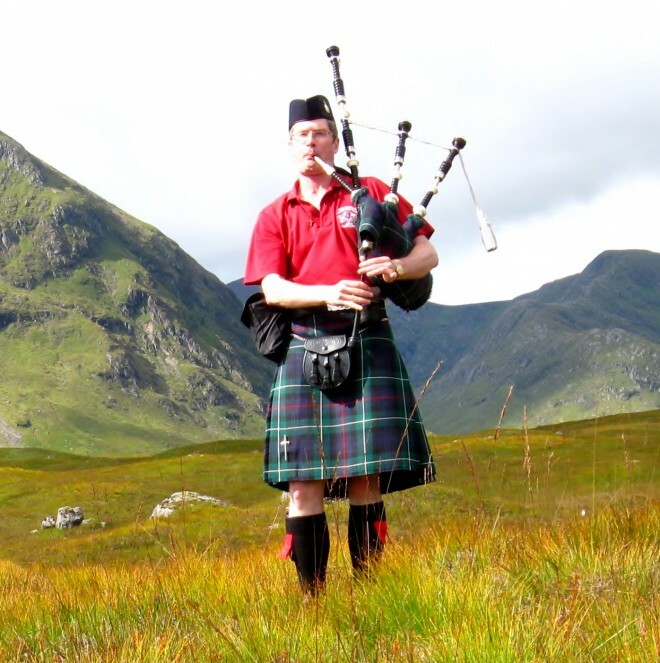 At home his cat Nata may be found sitting on his lap or begging for more food, unless the bagpipes come out, at which point she cannot be found. He also has a dog Sam and a cat Videon that came with his house and provide companionship when he is out working in his garden or around the yard. Crystal grew up in southern Alberta, and graduated as a Registered Animal Health Technologist in 2007, from Olds College. She has worked in mixed and large animal practice in the area ever since, joining our clinic in 2014. In her off time, Crystal can be found volunteering for Alberta Health Services as a Pet Visiting Volunteer in both Claresholm and Nanton. As well as, being apart of Nanton Animal Protection Society, Ducks Unlimited, Walk for Guide Dogs, and other community activities. She enjoys camping , fishing, hiking, and spending time with her family. 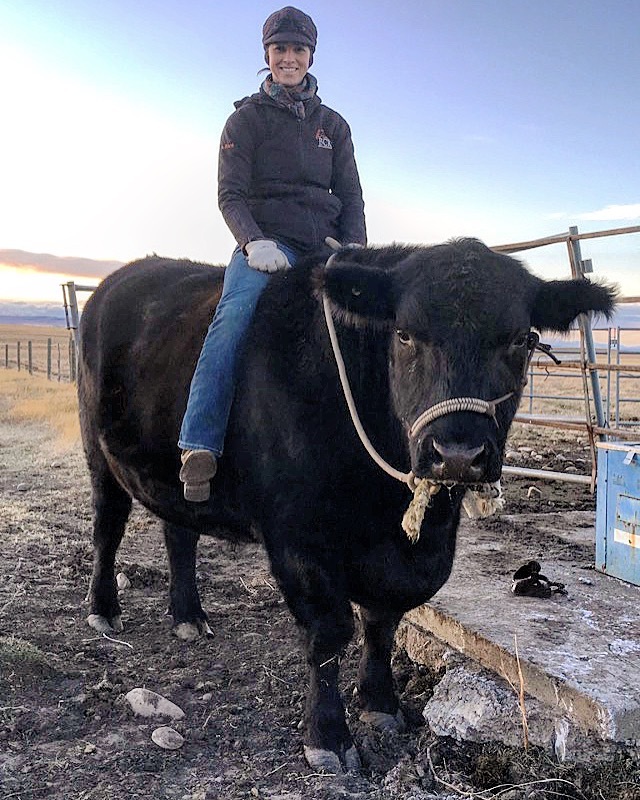 Joy graduated from Olds College as a Registered Veterinary Technologist in 2018, joining the Nanton Veterinary Clinic group shortly after her practicum ended. She grew up in southern Alberta and developed her passion for working with animals at a young age. With a love for both large and small animals, Joy enjoys the exciting variety of patients and cases that a mixed animal practice brings. 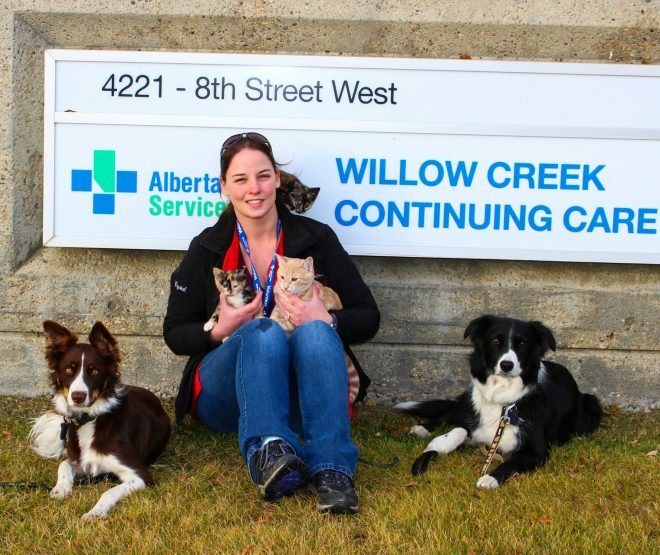 In her spare time, Joy enjoys volunteering with the Alberta Spay and Neuter Task Force as an RVT. She also enjoys spending time outdoors, hiking and camping, or at home with her adopted cat, Carrots. Debbie grew up on a farm in Nanton and graduated from L.C.C. in 1984 with a diploma in secretarial sciences. She has been a part of the team at the clinic since 1991, so has seen lots of changes in the clinic, one of them being our new purpose built clinic. She appreciates being a part of the clinic’s growth over the years, and has learned a lot of useful things and met many wonderful clients and their animals. Debbie lives in Nanton with her daughter Kayla. 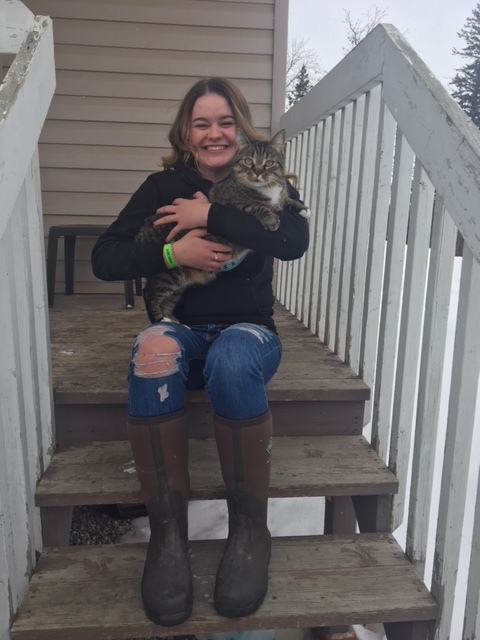 Aleisha joined the Nanton Vet Clinic in June 2013 as a part time receptionist and assistant, and now she is working full time. She is originally from a small town outside Vancouver, BC, but now calls Nanton home. Aleisha grew up riding jumping horses all over North America and Mexico thoughout her early adult years. Her furbabies consist of 5 dogs, 2 steers, and 3 horses. In her spare time she enjoys fishing and checking out the stars. 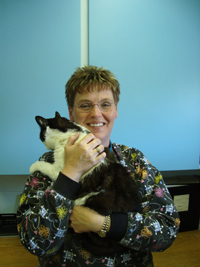 Heidi is a wife and mother of 2 amazing teenagers who has worked at the Nanton Vet Clinic for 8 years. She recently moved into a vet/ tech assistant position that shes very excited about. Heidi lives with Her family on a small acreage with Her 3 cats, 2 dogs and 2 senior horses. Her hobbies include playing her guitar and reading. Heidi also spends her free time volunteering. She sits on the board for Nanton Animal Protection Society here in town. She’s also the Patient advisor for the South Health Campus ICU/CCU centered care board. Heidi has big dreams of going to Hawaii one day. Burnie has retired! Burnie started to feel lonely after Nylas passing, and when he went home with Heidi for a week over Christmas, the decision was made. That is he made the decision. He now enjoys being able to roam in the country and not having to live in a kennel at night. 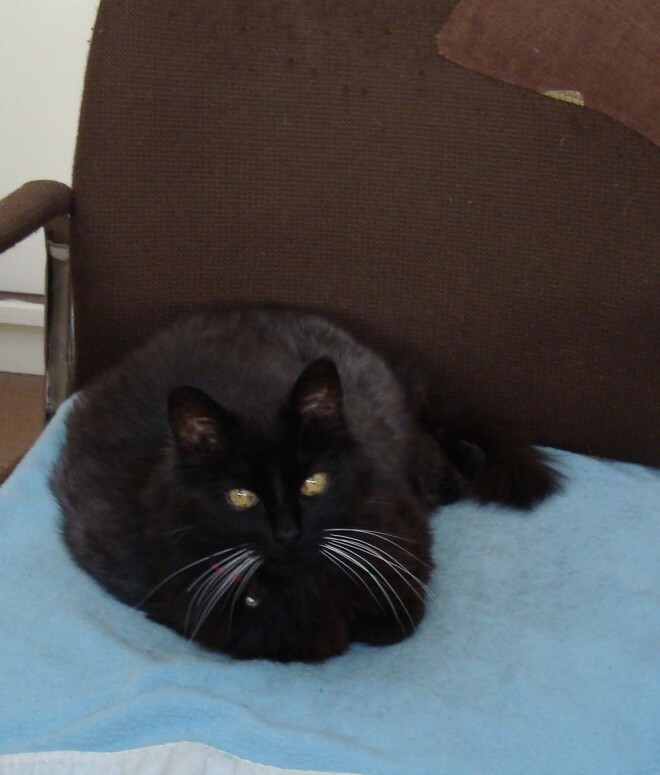 Burnie originally came to us through the Nanton Animal Protection Society. He became part of our family very quickly. We miss having him around, but we know he enjoys his new digs and now has all a cat could ask for. 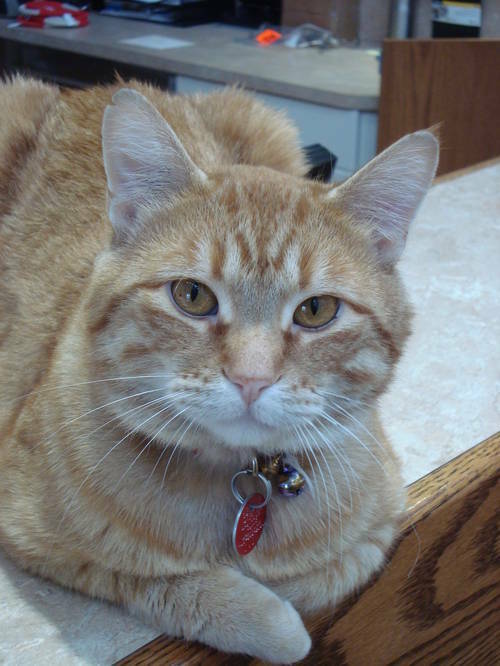 Dash was our long beloved clinic cat. When she was a tiny kitten she was brought in by a RCMP officer, and he had to pull apart the dash of his cruiser in order to get her out, thus giving her name. 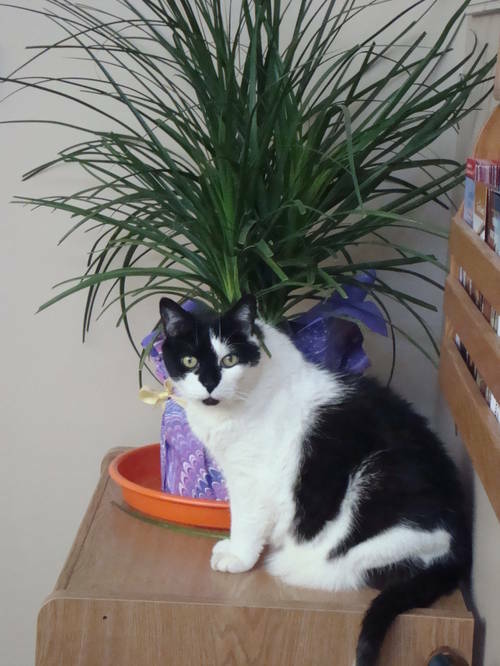 She grew up as a clinic cat and was well loved for many years. Sheis missed by all. Nyla came to us in the summer of 2014. She was having some health problems and not doing well at NAPS. After an adjustment period to life at the clinic Nyla thrived for several years before new health problems emerged. At first we could keep her healthy with medication, but eventually there was nothing more we could do for her. She is missed at Debbies back warmer.